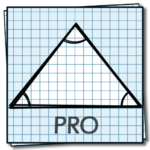 We just released a “Pro” version of our Triangle Calculator. Same as the free version except ad free! Our free version has close to ½ million downloads!